Having been born and brought up in South India, which is known for it’s aromatic filter coffee, I’ve been a coffee lover all my life. Coffee, always brings me the delicious memories of my mother’s coffee. No Barista can make a cup of coffee like my mom. Yes, having been exposed to good coffee from a young age, I’ve turned into a coffee snob. When it comes to coffee, I like nothing but the best. 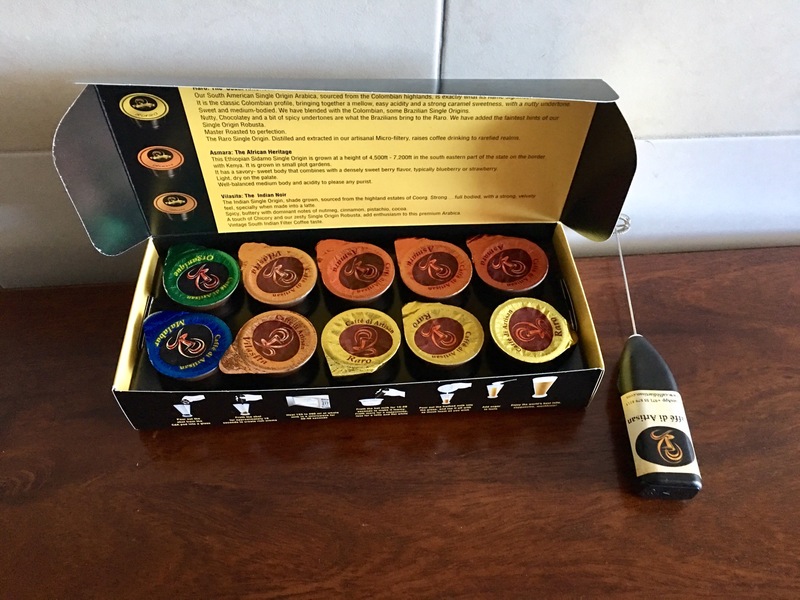 Last week Caffe di Artisan contacted me thru Twitter and asked if they could deliver a box of their Luxury Single Origin Coffee Pods to my home. I thought I’ll give it a try and agreed to the offer. I received the box of exquisite luxury single origin coffee freshly extracted, in single shot pods at my doorstep. It is easy peasy to make. Just open the pod, froth it and add the desired amount of hot frothy milk to it, viola! Your coffee is ready. With Caffe di Artisan, you get zesty, strong, smooth coffee. But never bitter or burnt or over extracted coffee. Caffe di Artisan’s coffees have vibrant flavors, good balance, bright acidity and have a long lingering finish due to their artisanal micro-filtery that gently teases out the subtle flavors, sugars and oils from the delicate grounds. Now, you can make finest artisanal lattes, cappuccinos, espressos at home without complicated and expensive machines. Each of the coffee varietals were deliciously different, my favorite was the African Asmara. Their single origin come in convenient liquid single shot pods. Each pod is made to order. They start roasting, grinding, micro-filtering your coffee pod only after receiving your order, hence each pod has an absolutely fresh coffee shot. They deliver directly to your home or office. Free delivery charge for a minimum order of 10 pods. A box of 10 pods costs around AED 20-30. Their liquid single shots remain fresh for up to 30 days in the refrigerator. Free Frother with your first order.